The year 1959 marked two major events in local history. The first was the granting of self-government status to Singapore. The second major event was the PAP’s overwhelming victory in the general elections and, with it, the appointment of Yusof bin Ishak as the first local-born person to become the Head of State of Singapore (Yang di-Pertuan Negara). In 1965, when Singapore became fully independent, he remained as the Head of State with the title of President of the Republic of Singapore. Besides the stamps issued in his honour, there are currency notes bearing his portrait. 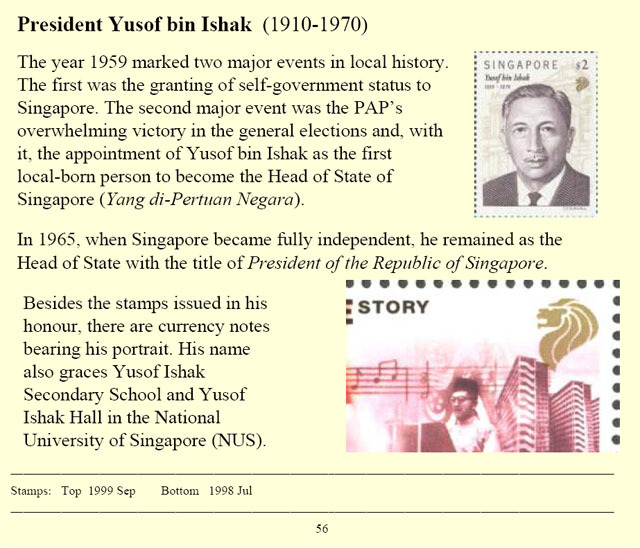 His name also graces Yusof Ishak Secondary School and Yusof Ishak Hall in the National University of Singapore (NUS). I was just searching for this information for a while. After 6 hours of continuous Googleing, finally I got it in your site. I wonder what is the lack of Google strategy that do not rank this kind of informative sites in top of the list. Generally the top sites are full of garbage.